They are incredibly beautiful and it's no surprise that a culture based on the calm and collected psychologies of Shinto and Zen would notice, write a song about it, and continue to honor that song for centuries on a traditional instrument such as the Koto. 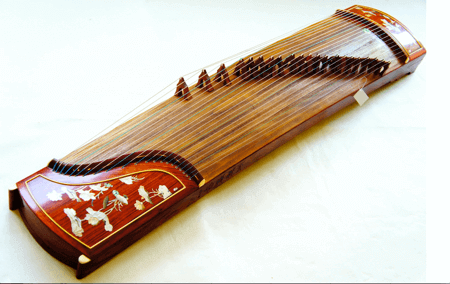 The koto is a classical Japanese stringed instrument akin to a lap steel guitar. Just for the sake of saying it, the Japanese also have a stringed instrument more like an acoustic guitar called the shamisen. 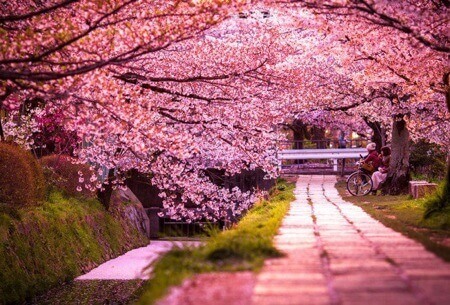 Sakura was written during the Edo period of Japan, roughly around 1600 to 1850 when the Tokugawa shogunate ruled the land. This folk song was just your typical urban melody until the Tokyo Academy of Music used it as a beginner's song in their 1888 Collection of Japanese Koto Music for koto students. Let's go and see them! The lyrics are simple and descriptive with tons of imagery that evoke all of the senses. We just don't do it like we used to. Now as you listen to Sakura on koto above, imagine hearing it as a faster version, with a more MIDI synthesizer type of sound... like something you'd hear out of a 1980's NES video game. If you're my age, about 30 years old, and a male, and fortunate enough to have owned a Nintendo, then this is what burnt the melody of Sakura into your brain for forever. You learned to hate it as Piston Honda treated you like Glass Joe round after round until you figured out his patterns. I fear, unless someone includes this song as the entrance theme for some fighter in an MMA video game, kids will never learn about the beauty of the cherry blossom. I've done my part. Help me share the good word.